When I saw that Berkshire Hathaway was buying out Precision Castparts last weekend, I got that good feeling you get when you know one of the stocks you own was about to increase in value. However, as I looked at it a little closer, it just made me feel like I missed an opportunity. I started accumulating Precision Castparts late last year, when it showed up on my list of stocks that met my criteria. Management seemed to be sound, stable industry, reasonable valuation – a good long term holding. Unfortunately for me, my timing was lousy because soon after I built my initial position, the stock dropped roughly 20% on lower guidance due to the strong dollar and exposure to the energy sector. I think I should of looked closer at the stock before I started accumulating, perhaps I would of held off a bit. I will give myself some credit – I did add to my position even after the stock dropped – I try to follow the old saying ‘If you liked the stock when it was 20% higher, you should really like it now.’ It’s hard to follow this adage, but I felt the leadership was still good and hopefully most of the bad news was out of the way. So its nice that in the end my analysis was vindicated, and I can now claim to almost be as smart of investor as Warren Buffet. However, in the end, if feels like I botched it. At the Berkshire Hathaway takeover price, I will probably break even on my investment, maybe come out a little ahead. To add insult to injury, that position I added $210 a share will likely be taxed as a short term gain, and its possible my initial purchases will be a long term loss, though it will be minimal. I have come to accept that in investing you win some and you lose some – it just comes with the territory. It’s just that in this case, it feels like I should of won and I didn’t. For the last few years I have been tracking my asset allocation on a spreadsheet, to ensure that I keep within the rules I set for myself of what to invest in. If I look back to the early days of my investing, I believe I have a tendency to overweight in stocks when the market is doing well, and underweight when the market is low. Most investors do succumb to this emotional tendency – buy high – sell low, and so I think every investor should use an asset allocation strategy to try to drive emotion out of investing. Note that my sample allocations are spread across a wide variety of asset classes. This tool includes a lot more categories than the average investor would care about, but I thought it was good to include as many categories as possible to at least make investors think about what categories to consider. 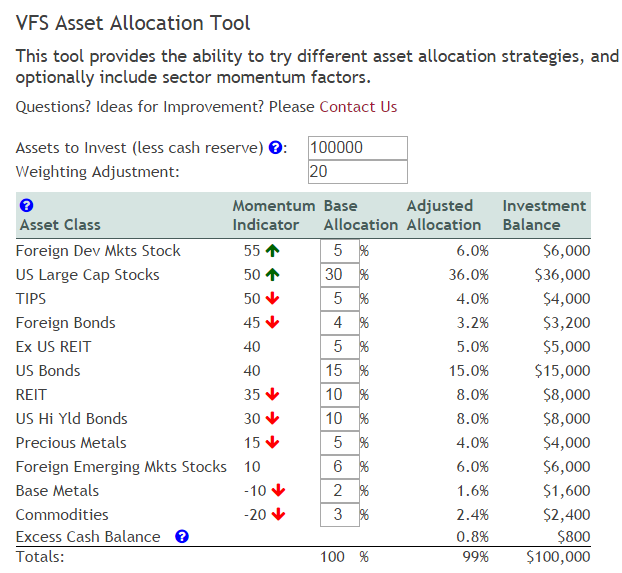 Note also I included the red and green arrows next to most asset classes. This isn’t too clearly explained in the page – but it ties back to some of my earlier work in asset allocation where I adopted a strategy of over-weighing categories based on momentum. To recap – historically if you overweight / underweight the S&P 500 based on a 10 month moving average, history tells you it will increase your return. So I have expanded this to include overweight / underweight indicators for the other asset classes where history shows a return increase based on momentum. Note that some asset classes show no correlation to this strategy, and for those I did not factor those into the weighting adjustment. As a side note – for those categories I plan to someday look into what factors could also be included to see if a pattern can be determined – but thats on my ‘someday to-do list’ at this point. The other framework decision I made with this tool was to host this at vfsystems.net. Rather than have these tools on Puget Investor, I plan to have VFSystems be the home for my investing tools, and focus Puget Investor back to a stock portfolio tracking tool. I think vfsystems.net makes for a better jumping off point for my various investment related endeavors, so look for more tools to appear at vfsystems.net. I encourage anybody with an interest to try out this new tool – it may help you refine your investment strategy, and perhaps give you new ideas about investing alternatives. And please – any ideas for improvement or feedback – please leave a comment below, or send a note to Vertical Financial Systems.